It’s testament to just what a miraculous job Shigeru Miyamoto did in 1985 that Nintendo can release essentially the same game these days and it’s still one of the best titles put out all year. While there continues to be a Mario revolution with games such as Super Mario Galaxy, it’s the gentle evolution of the New Super titles that seems almost more remarkable than Miyamoto simply redefining the genre again, as the gaming dreamworker seems to do at least once every 5 or 6 years. New Super Mario Bros 2 has moved on very little from the previous two incarnations on DS and Wii. There’s a coin-based twist that I’ll get to later, but besides that, it’s essentially the same game that was essentially the same game as Super Mario Bros 3 which, in turn, was merely a step forward on the aforementioned ’85 original. 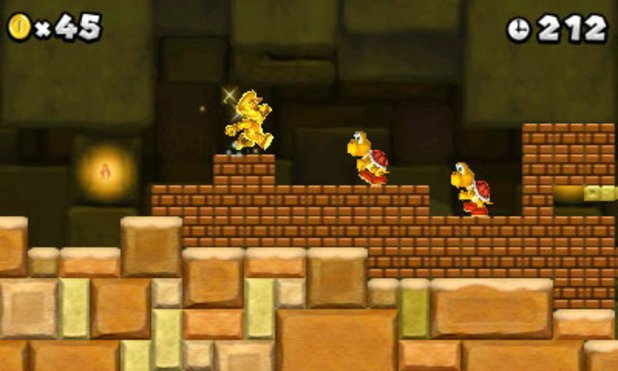 You run, you jump, you stomp or Koopa heads. It’s simple gameplay, but, after 27 years, it’s oh so well defined. After so many goes that the 2D platforming genre, you’d be surprised Nintendo can still churn out any new ideas. While most levels do, admittedly, step on the toes of previous Mario games, there was not a single point in which playing through the games 9 worlds that I felt as though I was sick of what Nintendo had put in front of me. Yes, they re-use sinking platforms, lava pits that spit out fireballs, big swaying mushrooms and other Mushroom Kingdom mainstays, but can either find something to make it seem sort-of interesting again, or failing that they simply use them sparingly. After all, we’re so use to castle stages with those platforms that resemble a game of Snake that it wouldn’t be the same without them, right? Where Nintendo does change things up a bit is with the implementation of the coin gimmick. Levels are now stuffed to bursting point with the gold shiny things, and Nintendo claims they want you to reach one million of the blighters. While I’ve finished every level and collected the majority of star coins, I’m still only knocking on the door of the half-way stage. It’s a massive task and it’d be a huge slog if you decide to go for it, but nabbing coins has always been satisfying without any real motivation, so Nintendo giving you a reason is actually, in my eyes, a step forward. Levels now each have a coin high-score recorded for you and there’s also a new Coin Rush mode that encourages you to just nab as many coins as possible inside a time limit. These scores can be shared over Streetpass, although as they appear in a separate option on the menu rather than on the main map of your copy of the game, they don’t seem as compelling as Super Mario 3D Lands’ time challenges. In fact, that’s the games’ main problem. It’s nowhere near as compelling as 3D Land in any capacity. While this was to be expected, it’s always slightly disappointing when Nintendo of all people can’t follow up a hit. While, as I said, there are some fresh takes on the classic Mario staples, 3D Land seemed to take the sheets of paper being held together as well and transform them into a new beast. It just feels like NSMB2 lacks the ambition of the other Mario on 3DS, and the fact that this was made by junior employees rather than Nintendos’ old tried-and-tested team that’s been working on Mario since Goombas were but a blip in Miyamotos’ head. This entry was posted in Games and tagged 6/10, Games, Mario, Nintendo, Nintendo 3DS, Platformer, Shigeru Miyamoto by Robbie Owen. Bookmark the permalink.